Ever since childhood I have been crazy about all sorts of dogs. After a long period of nagging at home my parents gave me a dog as present on my seventh birthday. Two weeks later the poor thing, a mixed breed, had lost my attention. A year later my parents had had it, and gave the dog away. Although I had not been mature enough to take good care of a pet, I grieved the loss of my dog and visited him every holiday. A few years later, at the age of twelve, I once more started to long for a dog. My mother once more surrendered to my nagging, and I was given a golden retriever. This time the dog got a better master, I did everything for her. When taking my “Sussie” to the local kennel club, I got to know a girl who owned a papillon. It was love at first sight…with the dog that is. I was totally infatuated with this delicate and beautiful breed of dog. 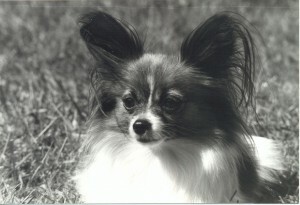 In 1984 the girl’s mother Anita Forsberg bred and sold me my first papillon. “Carovers Tootsie”, was a wonderful dog and true friend who gave me unforgettable memories. She was the foundation of Kennel Caratoots, and I have a lot to thank her for. In July 1998, at the age of 13 years, her body was giving up on her, and I had to put her to sleep. Fortunately her soul lives on in her offspring, that is still with me. To my delight she also has passed on her stable temperament to all her offspring. I am still very grateful to Anita at Kennel Carovers for her time, support and answering all my questions, when I decided to devote my life and time to papillon. Kennel Caratoots celebrated its 30th anniversary during 2014. 20 years of great joy and passion! My devotion to breeding and showing papillons is as strong today as when I started. Our top winning papillons can be found not only in Sweden, but also in several countries around the world. Already in December of 1997 Caratoots Swedish Papillons joined the cyber world of internet. With help of my husband and webmaster Peter Gänger, Caratoots today has, I dare to say, one of the most visited papillon breeder website in the world.